Osteopathy differs from other types of manual therapy in that it takes into account the patient’s environment, emotional state and thought processes as well as their physical state when diagnosing and managing their condition. It recognises that no two people are the same, so treatment is tailored to the individual. I use a variety of techniques to relieve pain and improve how the body is functioning. These can include massage and stretching techniques to relax tight muscles and techniques to improve joint movement, such as joint articulation and manipulation (that well-known clicking often associated with osteopathy), to name just a few. 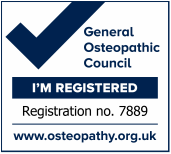 The following information is taken from the British Osteopathic Association website. Although osteopaths treat many conditions, most people think of us as ‘back specialists’. Back pain is what many osteopaths treat a lot of the time. Osteopathic treatment does not target symptoms only but treats the parts of the body that have caused the symptoms. Osteopaths have a holistic approach and believe that your whole body will work well if your body is in good structural balance. Imagine, for example, a car that has one of its front wheels not quite pointing straight. It may run well for a while, but after a few thousand miles, the tyre will wear out. You can apply this example to the human body, which is why it is so important to keep the body in good balance. We use a wide range of techniques, including massage, cranial techniques (sometimes referred to as 'cranial osteopathy') and joint mobilization and this breadth of approach allows us to focus on every patient’s precise needs. Go here for an overview of conditions we treat, what we do and how we do it.